Police in Chandler, Arizona, have released surveillance footage from an April 2016 shootout that left two officers injured and the suspect dead. 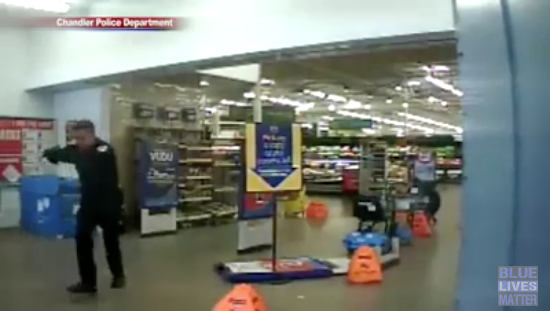 On April 23, 2016, at around 6:21 a.m., Officers Joshua Pueblo and Daniel Colwell responded to a non-emergency call about a person trespassing at a Walmart store, police said. Colwell arrived first and spoke with the suspect, whom police identified as Mitchell Oakley. Police said that shortly after Pueblo arrived, Oakley then shot both officers multiple times. In the video footage, which shows multiple angles of the scene unfolding, officers can be seen talking with Oakley, who is seated in a chair in front of them. As Oakley stands up, he suddenly starts shooting as shoppers scatter. Pueblo, 34, was shot three times — in the torso, arm and face, police said. Colwell, 29, was shot two or three times in the torso. The force of the bullets sent him flying through a display. But he was able to get back up and return fire, killing Oakley as he tried to run out of the store, according to police. Both officers were wearing ballistic vests. Chandler police said that Pueblo is still recovering from his injuries — he has nerve damage in his face — and has not returned to duty. Six days after the April shooting, however, he left the hospital to a standing ovation. “Officers Colwell and Pueblo are two examples of the men and women who continue to risk their lives every day protecting our communities … They put their lives on the line and acted heroically … I couldn’t be more proud of both officers,” police chief Sean Duggan said.